Berrick Barnes put on a kicking masterclass as Australia battled to a hard-fought 32-14 win over Italy at the Stadio Artemio Franchi on Saturday. Barnes kicked a perfect eight out of eight - six penalties and conversions from tries by Drew Mitchell and Rocky Elsom - but it was far from comfortable for the Wallabies. The Azzurri pulled to within four points at half-time and a try from Robert Barbieri exposed the visitors' scrum problems once again, but in the end they were strong enough. Barnes already had three points to his name when Australia got the first try of the game when Mitchell bundled over after a sweeping attack had been stopped just short of the line. Barnes converted, before Mirco Bergamasco put Italy on the board with a penalty. Barnes cancelled that out to re-establish Australia's 10-point lead after 13 minutes and at that stage they seemed to be in control. 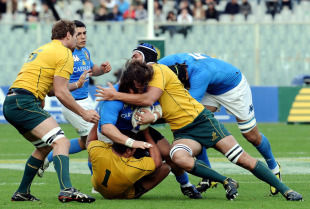 But Italy dug in, not allowing the Wallabies space to play, and eventually clawed their way back into the game. Luciano Orquera scored a long-range penalty, which just crept over and needed video replays to confirm its validity, and Bergamasco added another three-pointer on the hooter to make it 13-9 at half-time. Italy's hopes had all but vanished within 10 minutes of the restart, though, as Barnes split the posts with three more penalties. A fourth made it 25-9, before the Azzurri got a try courtesy of Barbieri. On as a replacement for Paul Derbyshire, he picked the ball up when it ran lose following a scrum yards from the Australia line and went over. But Elsom made light of Australia's problems at the very end, collecting from the scrum to go over, with Barnes completing his flawless outing by adding the extras.